Smart Lighting Market size is set to exceed USD 24 billion by 2024; according to a new research report by Global Market Insights, Inc. The smart lighting market growth is attributed to worldwide initiatives for smart city development and the growing popularity of home and building automation systems in residential, commercial, and industrial sectors. As the modernized smart city infrastructure offers intelligent connectivity among different components of the administrative framework such as transport, healthcare, and law & order, further initiatives for developing smart cities are likely to be undertaken aggressively around the world over the next one decade. Smart lighting products are used in different applications to enable highly connected and energy-efficient lighting solutions. These applications include commercial, residential, industrial, and outdoor lighting applications such dynamic traffic management systems employed in public places, highways & roadways, tunnels, and bridges. Developing economies can largely benefit by deploying smart lighting systems for the outdoor lighting applications to ensure energy security and sustainability. The communication technology market is expected to exhibit excellent growth between 2018 and 2024 due to rapid advancements in wireless communication technologies such as LPWAN, Wi-Fi, and hybrid technologies. With the increasing popularity of highly interconnected IoT-based smart city ecosystem, these technologies are expected to play a critical role in enabling such intelligent and data-driven infrastructure. In the light control market, sensors are expected to exhibit the fastest adoption over the forecast period. This accelerated adoption can be attributed to technological advancements in different types of sensors, such as occupancy sensors and motion sensors, which enhance the ability of smart lighting systems to effectively react to the surrounding conditions. Also, as these sensors enable remote operability of lighting systems through mobile devices, their utility in connected lighting solutions is likely to increase substantially over the forecast timeline. With the rapid adoption of LED bulbs to replace traditionally used incandescent lighting systems, the LED market is projected to exhibit accelerated growth with a CAGR of over 20% between 2018 and 2024. As LED light bulbs enable significant cost savings (more than 50%) compared to traditional bulbs, their adoption in smart lighting systems is expected to grow exponentially over the forecast timeline. The outdoor lighting market is projected to register a fast growth over the forecast period due to the increasing popularity of intelligent street lighting systems in the smart city infrastructure. With embedded sensors and digital networks, these systems collect and transmit information that helps city administrators to monitor and respond to any circumstances related to air quality, traffic levels, and noise levels on the streets. Also, by intelligently controlling the operating period of lights, substantial cost savings can be realized by minimizing the energy wastage. Europe is projected to hold a dominant position in the market by 2024 with a market share over 30%. This market dominance is attributed to growing emphasis on developing smart city infrastructure in the region and the large-sale installation of smart lighting system across the commercial and residential sectors. The European Union (EU) is consistently focusing on developing highly connected smart city infrastructure across the region while encouraging participation from public and private stakeholders. Through its funding instrument, The European Innovation Partnership on Smart Cities and Communities (EIP-SCC), brings together industry and citizens to enhance the urban life using more sustainable and integrated solutions. 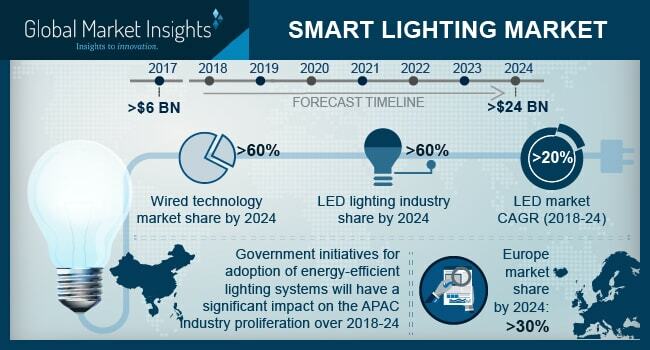 The Asia Pacific smart lighting market is projected to witness the fastest growth between 2018 and 2024 due to growing awareness among emerging economies including India, Japan, and Singapore regarding the efficacy of connected lighting systems in enabling significant cost savings through optimal energy consumption. The companies operating in the smart lighting market are consistently involved in new product development initiatives and product innovation activities. For instance, in January 2018, the company announced that it is previewing two new products to this portfolio that are expected to be launched later in 2018, a smart light switch and a ceiling light. These products can control smart assistants including Alexa and Google Assistant and will have a built-in hub, which lets them control other C by GE products as well. Similarly, in April 2017, Philips Lighting launched the Philips InterAct Office connected lighting system aimed at the global office lighting systems market. The solution allows building managers to reduce energy consumption by nearly 70% and optimize operations. Some of the key payers operating in the market are, Bridgelux, Cree, Digital Lumens, Echelon, Schneider Electric, Acuity Brands, Honeywell, GE Lighting, Secil, Cooper Industries (Eaton), OSRAM, Lutron, Hubbell, Philips Lighting, Silver Spring Networks, Legrand, Tvilight, and Zumtobel.